Urban Adventure League: Coffeeneuring Ride #6: Phoning it in? Coffeeneuring Ride #6: Phoning it in? With any “challenge” longer than a few weeks, it seems inevitable that enthusiasm will dwindle after those first few weeks. I came out of the gate all fired up, accomplishing four “Coffee Outside” adventures in a row. But now I have less time and more stuff on my plate. It’s getting harder and harder to squeeze in a true Coffeeneuring Ride, at least under the parameters of the rules Mary set up. She was very gracious in granting me an “exception” so I could do a ride after work last week for Coffeeneuring Ride #5, as I had no other real opportunity to do so. But this past week? It was tough. I had two non-consecutive days off, Wednesday November 13 and Friday November 15. Wednesday was occupied with a day-long Bike Tourism Conference, so Friday would be the day, though that day was filling up with errands and such. I could pull off something, but it would be the bare minimum. It almost would feel like I was phoning it in, which is something I don’t like doing. Or could I just stop? Mary created an “Honorable Mention” category for those who started the Coffeeneuring Challenge but couldn’t finish for whatever reason. I thought about this for a moment, but hell, I’m already five weeks in on the seven week challenge. I can see the finish line in the distance. Just do one, Shawn, even if it is “phoning it in”. 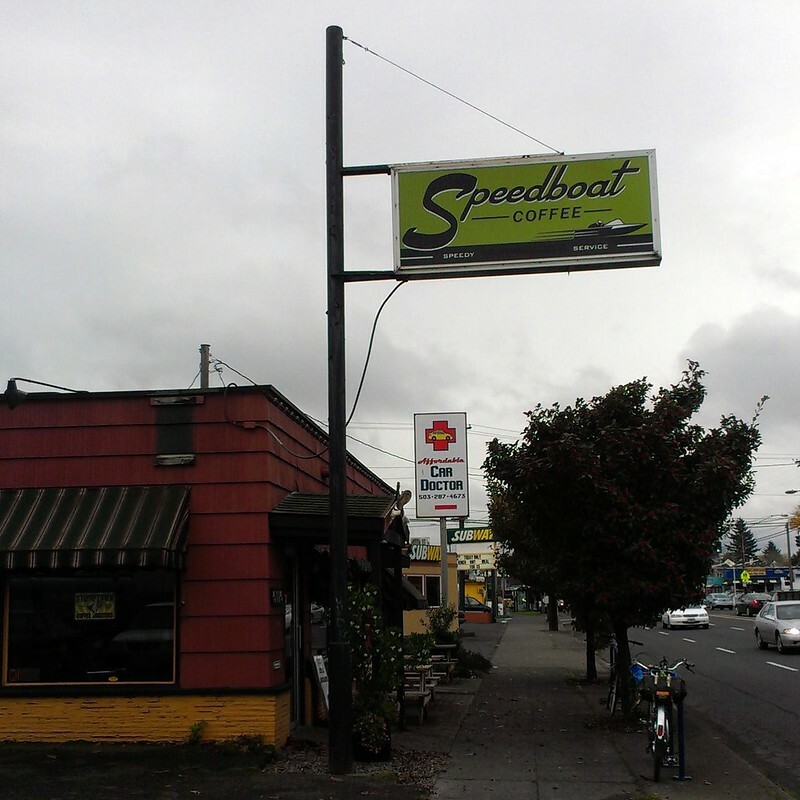 So on Friday November 15 I rode my Raleigh Crested Butte from my house off SE Hawthorne three paltry miles to Speedboat Coffee on SE Foster Road. 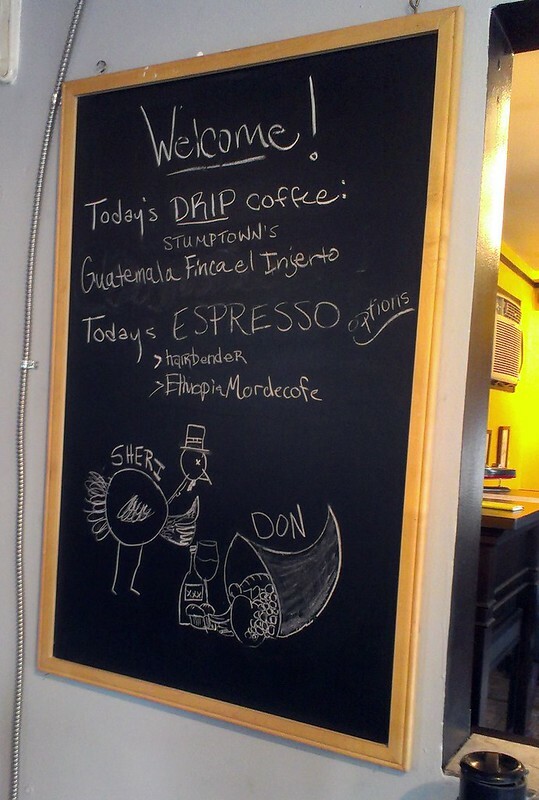 I got the house drip coffee, which was Stumptown’s Guatemala Finca el Injerto. It was good. Tune in next week for my final coffeeneuring ride of this year’s challenge, where I hopefully won’t phone it in.